Miss Sue, director of the “Can Do” Recreation Center called an assembly shortly after the “Can Do” kids arrived for spring break camp. She didn’t look pleased as she stood on the stage, in front of the microphone stand. “It seems that many of you are not practicing good bathroom behaviors. I need to speak with you about complaints I am receiving from the janitors responsible for keeping our center a clean and healthy place where all of you can enjoy spring break camp. How do you feel when you have to use the bathroom and their is lots of toilet paper on the floor, or the toilet seat is wet and so is the floor? Doesn’t make you mad when the child using the toilet before you didn’t flush? And what about the kids who leave a dirty mess in the sink and on the floor around the sink, and then throw the paper towels they used on the floor? Some of the “Can Dos” looked uncomfortable, but no one said anything. After Miss Sue’s announcement, most of the “Can Dos” were quiet. Some were going over how they behave in the bathroom. Willie and Hector, and Bobby wanted to know who snitched on them about the water fight they had in the bathroom during recess yesterday. They did leave a watery mess. Someone coming in after the water fight could have slipped and fell. They all agreed that maybe the water fight wasn’t such a good idea after all. The next day, Nurse Diane began calling five “Can Dos” at a time, and bringing them into a room set up just for the bathroom behavior show and tell sessions. It had an operational sink and a dry toilet. Helping her demonstrate, and assisting the kids in practicing were two camp counselors, Molly and Tommy that the “Can Dos” really like and want to impress with their good bathroom behavior and manners. Check the bathroom floor, when you enter the bathroom, to make sure you know if and where there is water on the floor, so you don’t slip and fall. Find an empty toilet stall. Make sure it is clean: no water on the seat or wet toilet paper. If it isn’t, find another stall that is clean with a dry seat. If there are none, take a few pieces of toilet paper and wipe the seat before you sit down. Throw the toilet paper into the toilet. Using the non-working toilet, Tommy demonstrated lifting the seat. Molly demonstrated wiping the seat. If you are a boy, raise the toilet seat before using the toilet. Lower the seat when you are through. Tommy demonstrated lowering the seat and the lid. When you are ready to flush, take 2 squares of toilet paper and use it to handle the flush, then throw the paper in the toilet bowl. Molly showed how to flush the toilet using toilet paper. As you are leaving the toilet stall, take another 2 squares of toilet paper and use it when unlocking the stall. Turn on the water, make sure it is warm, rinse your hands, lather up your hands with soap, be sure to wash between your fingers and all over your hands. Continue to wash your hands until you have completed singing the Happy Birthday song twice. Rinse your hands until all the soap is gone and your hands feel clean. Use two paper towels to dry your hands. Wipe off the rim of the sink, if you have gotten water all over it. If the bathroom has a door with a knob, save one of the towels to open the door, then throw it out in the first waste paper basket you see after you leave the bathroom. If the bathroom doesn’t have a nob on the door, throw your paper towels in the waste basket before leaving the bathroom. “Well done “said Nurse Diane. “Thank you Tommy and Molly for your assistance. Miss Pat called the class to attention after the first bell rang. Just as the “Can Dos” were coming to attention the door opened and in walked Nurse Diane. “Am not”, said Hector, “Are too” said Willie. Miss Pat called on them to share what they were talking about. “Nothing, answered Hector. Miss Pat answered. “Then talk about nothing quietly. The class laughed, and Nurse Diane began to talk about why she had come to their classroom..
“It’s that time of year again; time to get a flu shot,” said Nurse Diane. A groan went up in the classroom. Some kids called out about how they hated getting a shot. Others shared that they were afraid of needles. Hector looked as if he didn’t feel well. 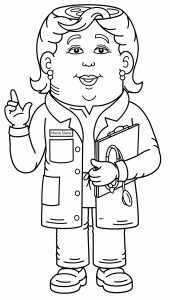 Nurse Diane smiled and said, “Going to the doctor to get a shot doesn’t have to be scary. Here’s what you need to know about getting a shot so you can be brave at the doctor’s. Shots are just a way to make sure your body has what it needs to fight off disease and keep you healthy. The small needle puts the medicine under your skin so your body can build up strength against diseases. When the doctor or nurse sticks you with the needle it will hurt a little bit, but only for a minute and then the pain will go away. If you’re nervous about getting your shot, talk to your parents about something else. It will help keep you calm and take your mind off the shot. Smile. It’s hard to be scared or nervous if you’re smiling. So even if you’re really scared about getting the shot, just keep smiling and it will help you be brave. Nurse Diane asked “Does anyone have any questions?” No one raised their hands. Hector was thinking about being brave when he got his flu shot. It sounded good when Nurse Diane said it, and after all, it would only take a minute. Hmm…it is worth a try he thought. I wouldn’t want anyone to think I was a big baby. Nellie, Arthur J, Annie, Kathy, Bobby, and Orrie had just gotten comfortable in chairs in front of the big screen TV set at Grandma Maureen and Grandpa John’s house. Grandpa John came in the living room with a couple of flashlights and a big lantern. “Looks like the storm knocked out our lights and the TV,” he said. The “Can Dos” really weren’t so interested in Grandpa John telling a story about movies in the olden days, but a story beat going to bed early, so they all agreed that grandpa’s story sounded like a good idea. “Well,” began Grandpa John, when I was your age there was no TV.” The “Can Dos” looked at him, not able to believe what they were hearing! “Nope, if we wanted to see movies, there was a special day and a special time to see movies at our local movie theater. Every Saturday morning from September to June would find us kids waiting in line in front of our local theater. It was the only chance we had all week to see out action heroes, Flash Gordon, Gene Autry and the Lone Ranger get out of dangerous situations and save people from harm. After the action serials came two movies that were just right for kids. About 9:30 every Saturday morning, our moms would hand us a brown paper bag with a sandwich in it for lunch, a quarter, which included money for admission to the theater, a small drink and a very small candy bar. We would line up in front of the theater, waiting for the doors to open. While we waited we’d be laughing, telling jokes and trading lunches with our friends. Once inside the theater, usherettes with flashlights would show us to our seats and keep close watch on us during the movies. Trouble makers were put out of the theater. There weren’t many of those; no one wanted to miss what happened to the action heroes. Besides, where would you go, if you got kicked out? If you went home, your parents would know right away that you had gotten in trouble and, as a punishment, you wouldn’t get to go the movies on the next Saturday . If you just walked around town, a grownup was sure to spot you and call your parents. Plus, it was just too much fun to be at the movies with all our friends to risk having to leave because of bad behavior. Before the movies started, the theater manager would come on the stage and ask us to stand, face the flag, which stood in the left corner of the stage, and put our hands over our hearts. Then we sang the our National Anthem and said the Pledge of Allegiance. For five hours, kids made there way to and from their seats, to the rest rooms and the candy counter. Just then the lights came back on and so did the TV. Grandma Maureen came into the living room and said it was getting late; there was not enough time to watch even one of the Disney Movies. Grandpa John waited until the “Can Dos” were safely tucked in bed. Then he went to his special storage cabinet in the bookcase in the living room , unlocked it, and took out two DVD’s that contained his favorite action hero movies from long ago. Grandpa John couldn’t wait to share Flash Gordon and the Lone Ranger with the “Can Dos”. He was so excited to be going to a Saturday at the movies after all these years! Grandma Sue visited the “Can Do”Kids in their classroom the other day. Miss Pat invited her to come and speak about volunteering. Before she could continue speaking, Eulyn raised her hand. Miss Sue called on her and Eulyn said, “What’s volunteering?” Miss Sue could see by the looks on some of the other children’s faces that she needed to explain volunteering. Eulyn was not the only one who wasn’t sure what volunteering was all about. “Volunteering is when you offer to do something for someone that needs help. You don’t have to do it, you choose to help because you want to help. You don’t get paid to help. You help during your free time,” said Miss Sue. Anne raised her hand next,”I don’t think my mom will let me go to a stranger’s house to help them out.” Miss Sue nodded, “Yes, we need to be safe. That is why we have come up with ways for children to be safe while volunteering. You can be part of a group that visits seniors at the local senior residence. You can do friendly visiting. Seniors get lonely and would love a visit from a young person for an hour or so once a month. There are seniors who want to learn the computer, but don’t have family to teach them and can’t afford to take lessons. If you can spare 45 minutes, once a week, you can sit with at senior at one of the Center computers and teach him or her computer basics, maybe even how to email and use the Internet. You can join a yard work group, led by Mr. Dooley. Once a month you will go as a group to a senior’s house to help with yard work chores during the spring and fall. Miss Pat gave the children some time to discuss the idea of volunteering. After class some of the “Can Dos” signed up for volunteering. Anne and Kathy, Nellie and Maria, Jay and Yundi signed up for friendly visiting at the senior residence. Orrie signed up to teach seniors how to use computers and so did Arthur J. Hector, Willie, Eulyn and Bobby signed up to be on Mr. Dooley’s team and do yard work. After their first volunteering session, the “Can Dos”who participated, gave a report to the class. It seems that each of the volunteers felt good about volunteering. The seniors really appreciated having them and the “Can Dos” got to see just how much they could help people by volunteering. You are currently browsing the blog archives for April, 2016.